POND PREDATORS Depending on what part of the country you live in, fish will have to face natural predators. Today, we'll discuss two of the most common. Depending on what part of the country you live in, fish will have to face natural predators. Today, we'll discuss two of the most common. The most common is the Blue Heron. There are a few tactics to employ for their protection. Your standard decoy is always an option. Herons are territorial, so another in the area will generally deter one from entering your pond. But, give the Heron some credit, they are extremely smart and will figure out it’s plastic if they’re in the same area for too long. So, they will need to be re-positioned every day or every other day. A second method is to provide hiding spots for your fish. You can build underwater bridges or tunnels using stacked stone or laying large diameter pieces of PVC piping with stone on top. These methods can provide areas for the fish to swim under and in. Another option is leaf netting. Yes, it can be mildly unsightly, BUT so is a pond with no fish. Ultimately, netting is the most fool proof method of protection. Other common predators are raccoons. They are generally nocturnal, so if you notice fish missing in the morning there’s a good bet it's a racoon. They usually swipe at fish from the pond edge- so you may notice dead fish outside the pond in the morning hours. One of the methods for preventing Blue Herons can also prevent raccoon attacks- leaf netting. Live humane animal traps are also an option. 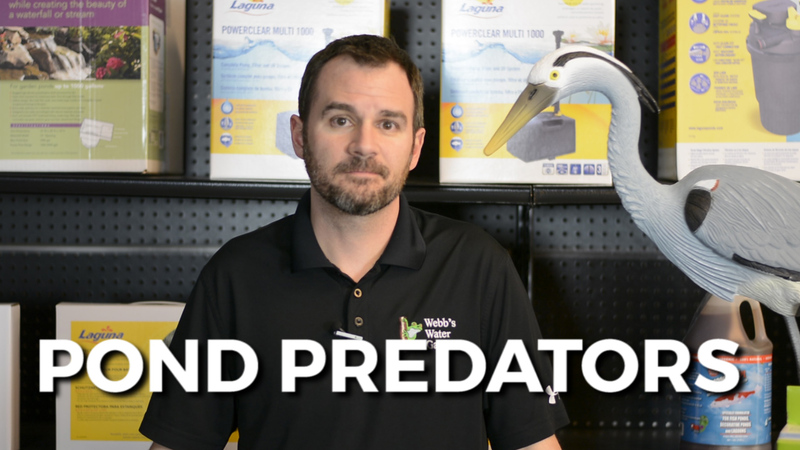 For additional information on predator deterrents, please give me a call. I'm Joe from webbsonline.